MINNEAPOLIS–(BUSINESS WIRE)–In a recent DTN/The Progressive Farmer Zogby Analytics poll, rural Americans expressed their continued support for President Donald Trump. Zogby asked rural residents if, given a chance, they would cast their ballots differently than they had in 2016. More than 70% said no. Further, the Zogby survey shows support for Republican candidates, for President Trump, himself, and for his trade policies. 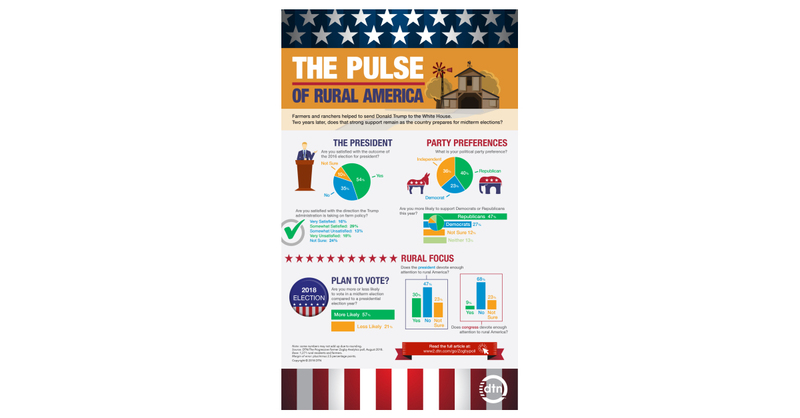 Two years ago, DTN/The Progressive Farmer conducted a Zogby poll, which showed similar results for rural voters. With only weeks remaining before the 2016 presidential election, that Zogby poll showed Trump leading opponent Hillary Clinton by nearly 2-to-1 among voting rural residents and farmers. In addition to showing support for President Trump, 45% of participants in the poll are satisfied with the direction the Trump administration is taking farm policy. Only 30%, however, believe that President Trump devotes enough attention to rural America, while only 9% of respondents believe that Congress does. Overall, 72% of respondents indicated that issues that affect their farm are more important to them than political party. The full report from the DTN/The Progressive Farmer Zogby Analytics poll is available in the October issue of The Progressive Farmer. DTN is the independent, trusted source of actionable insights for more than 2 million customers focused on feeding, protecting and fueling the world. Customer-focused and employee-driven, DTN focuses on empowering customers worldwide with decision-support solutions in agriculture, energy, commodity and financial analytics, and weather-sensitive industries through continuous, leading-edge innovation. The company produces The Progressive Farmer magazine, the premier publication in agriculture. DTN is based in Minneapolis with offices globally.